Half A Sixpence headlines Chichester's summer season this year and with Cameron Mackintosh co-producing, it's a rather grand re-working of Beverley Cross and David Heneker's 1963 musical. The original numbers have been reworked by Stiles and Drewe with a few new songs added too, in what is a light-hearted and delightfully dated snapshot of the English class system and its social mores around the turn of the 20th century. The show remains based on H.G.Wells' novel Kipps: The Story Of A Simple Soul but these days no respectable take on the Edwardian era would dare show its face without Julian Fellowes, Downton Abbey's esteemed progenitor, popping up somewhere in its DNA. Fellowes has been dutifully hired to re-write the book and to be fair, he's made a decent fist of it. But with one eye perhaps on a transatlantic export/transfer and the potentially short attention spans of our American cousins, the storyline has been kept tissue-paper thin. 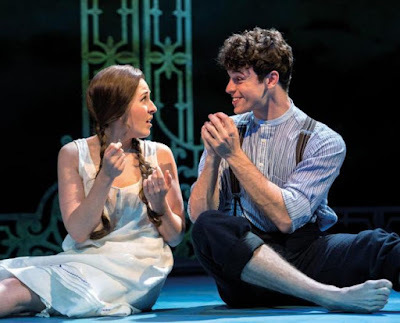 Set in coastal Kent, Arthur Kipps is a humble working class lad who falls in love with the equally lowly Ann Pornick. Upon inheriting a fortune he finds himself escalated to the “above-stairs” world, where a new romance emerges with the wealthy Helen Walsingham. Trials and tribulations follow, before an ultimate marriage to one of his paramours, all played out to a relentless moral backdrop that true love is more precious than material wealth. Originally a vehicle for the 1960's idol Tommy Steele who played Kipps, nearly every song featured his character and the reworked show upholds this premise. Charlie Stemp, an actor who has only played featured parts to date, is thrust into his first leading role and he shines. Fine in both movement and voice, Stemp is on stage virtually throughout and truly leads the cast. All of his songs are a delight, however the tender charm of his first half opener (the title song) along with the rumbustious romance of The One Who's Run Away which kicks off act two, display the range of the man's talents. Devon-Elise Johnson's Ann is an Essex-infused delight. She was first reviewed on this site in 2013 where (as a supporting performer) her starring role potential was clearly visible even then. 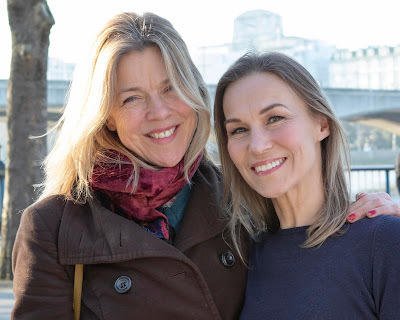 Johnson is a marriage of cockney charm alongside musical theatre excellence - a highlight being her take on Heneker's Long Ago, a beautifully reflective piece. As the quintessentially proper Helen, Emma Williams is, as ever, magnificent. Vocally gorgeous, Williams also offers the evening's briefest of dips into poignant pathos. Offered one of the newer songs to shine in, Believe In Yourself, throughout Williams re-asserts herself as one of the leading ladies of her generation. Fresh from playing alongside Williams in Mrs Henderson Presents, Ian Bartholomew turns in a cracking cameo as Chitterlow a writer who more than loosely mirrors Wells himself. Bartholomew has the presence and panache to drive the role along with a particularly corny chapter of the narrative magnificently, bringing an overstated flamboyance that complements the show like a fizzing cocktail and is entirely in keeping with his character. Downton enthusiasts will love the waspish sparking between dowagers Mrs Walsingham and Lady Punnet (Vivien Parry and Jane How respectively). Fellowes is no fool and has been wise to replicate the acid style of the TV series’ clashes between Maggie Smith/Penelope Wilton, which make for fine entertainment. Stiles and Drewe's input is a curate's egg. Their contributions to (a lengthy) act one don't compare well to Heneker's original numbers of 50 years ago and if one or two of those compositions were dropped it would be no bad thing. However, after the break, their work is revelatory. Their song Pick Out A Simple Tune is the closest thing to a showstopper seen in new musical theatre writing, offering an anarchic beauty (largely fuelled by Andrew Wright's outstanding choreography) that as each new verse and key-change reveals itself, leaves one wishing the song would never end. It really is that good! Rachel Kavanaugh's direction is masterful, playing her company well on the concentric revolves of Paul Brown's set. 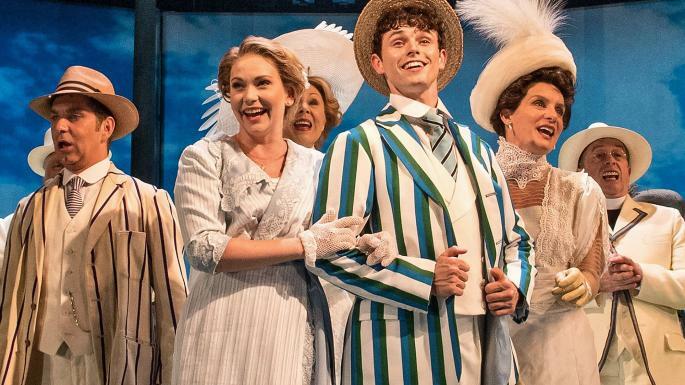 Truly charming, Half A Sixpence is flawlessly performed and well worth a seaside jaunt to Chichester.